The eve of the under-publicized 11th Annual New Jersey Thoroughbred Festival at Monmouth Park seems the perfect launching point for a segment over which I have long procrastinated -- straying from my usual drumbeat about handicapping contest strategy and introducing readers to the potential finer points of New Jersey's thoroughbred racing program. Being the punchline is par for the course for any lifelong New Jerseyan. This Saturday, however, "J-bred" runners will compete for purses worth more than $400,000 over a 10-race card. Still, outside of "Jersey Joe" Bravo and the annual $1 million Haskell Invitational, New Jersey's thoroughbred racing program, in my view, has little to hang its hat on, and ideas to entice recurring, rather than one-off, customers seem few and far between. Via the Jersey-Bred Spotlight, I hope to at least share my singular views of a program kicked too often to the curb by the Atlantic City lobby and certain legislators, but one that is greatly under-utilized and under-appreciated and where some great individuals work tirelessly to the good of New Jersey's program. Around the same time that I really caught the bug for thoroughbred handicapping (the contest circuit, specifically) a few years back, I became curious about racing ownership and attended a free seminar on the topic at Monmouth Park. Inside the Garden Room were maybe 15-20 other attendees to a presentation by Robb Levinsky, the founder, managing partner and racing partner for the Kenwood Racing partnership, based in Neptune, a stone's throw from Monmouth Park. I had no clue what to expect, or whether the presentation would be so convincing as to write Robb a fat check on the spot to become the next Ken Ramsey or Sheikh Mohammed bin Rashid Al Maktoum. Ultimately I put the thought of ownership on hold on account of my life's situation (i.e., able to afford, but married and with two kids another year closer to college), but it remains in my memory bank and I remain in contact with Robb through Kenwood's email distribution list. The impression I came away with that afternoon, and since reinforced by one anecdote in particular, was that buying a share in Kenwood was not about getting rich, but rather satiating one's love for thoroughbred racing at minimal expense (versus other thoroughbred ownership models or syndicates) and experiencing the highs, lows and in-between of owing a racehorse. The details of the partnership were straightforward in terms of costs for one share, the perks (potential purses, winners circle photos, club access, etc.) and pitfalls (buying a horse who never makes it to the track, career- or life-threatening injury) of ownership and the like, but what resonated most that summer afternoon was a theme of responsibility. Kenwood basks not only in the glory of winning races (the barn is in-the-money in 51% of 2013 starts, including 13 wins, 21 seconds and 14 thirds) and touting champion horses, including Hermosillo, who will be retired after Saturday and boasts an illustrious racing career, as evidenced by nearly $700,000 of winnings over a seven-year career. The stable treats its horses with great care, with health the A-1 priority. An email from May 29 is what piqued my interest in Kenwood's handling of its stock. In a long and blunt exchange to Kenwood's co-owners and friends, Levinsky shared the hardships of thoroughbred ownership, announcing the retirement of Sword Trick, a promising Texas-bred who had a dominant 2-year-old season and won a stakes race in his 3-year-old debut before being shipped by his connections to Monmouth Park in June 2012. After a game second in the 2012 Oh Say Stakes at Delaware Park, Sword Trick shipped back to Monmouth Park for a $35,000 claiming race on August 16, 2012, where Kenwood ponied up $35,000 to acquire the horse, a gelding. The seemingly innocuous "dueled between rivals and tired" footnote on Sword Trick after that race unfortunately foreshadowed tremendous misfortune for the Kenwood stable. The horse came out of the August 16 race with an injury, and despite the best efforts of Levinsky's team, Kenwood retired Sword Trick. "It was a costly loss for us, but that happens sometimes," Levinsky said in his May 29 email. "No sense...doing anything dangerous or unethical to try to get back a small fraction of the loss. (It) doesn't matter if it's claiming, or two year old(s) or private purchases, not all horses ultimately make it on the racetrack. That's how the game works." Now, mind you, Sword Trick was NOT part of any co-ownership group at that point. 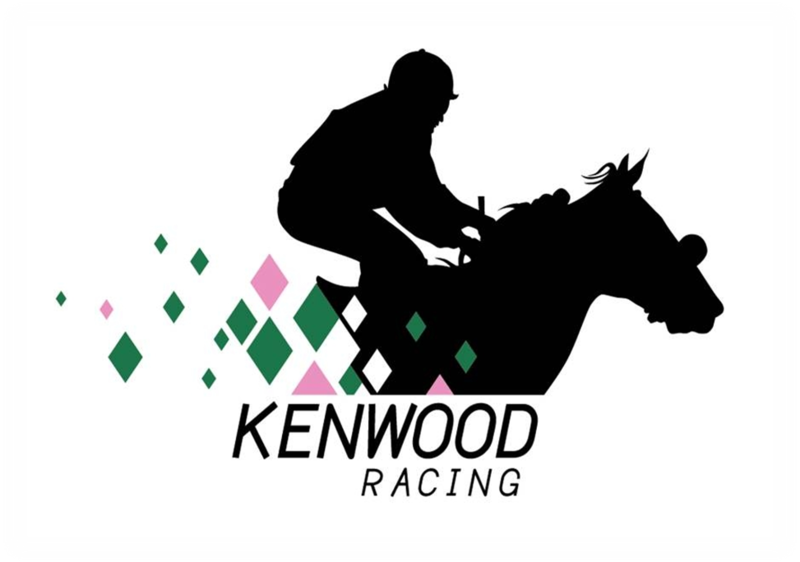 Kenwood footed the $35,000 claiming price and ate the entire expense, consistent with its business model of scouting and purchasing its horses, then packaging the horses for prospective ownership groups. "Many syndicates do just that (putting an injured horse in a group), which is why the industry doesn't have a sterling reputation with potential owners," wrote Levinsky on May 29, "but we don't work that way." Instead, what Kenwood did was to retire Sword Trick to the South Jersey Horse Rescue program, based in Weekstown and run by Ellen Strack. Sword Trick, considered to have a great personality, would never be a racehorse again but was deemed sound for riding and with a productive life ahead as a pleasure horse. 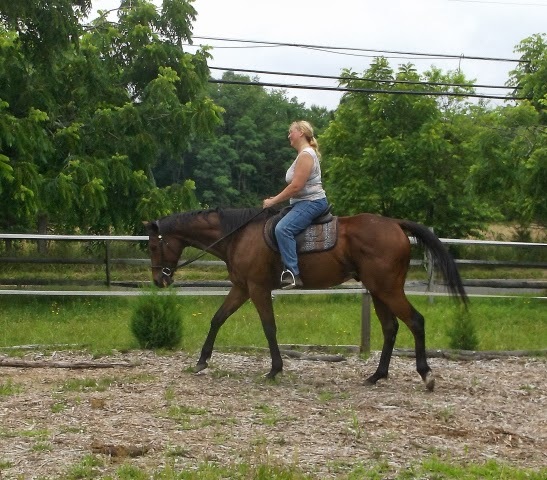 Kenwood made a generous financial donation to SJHR when Sword Trick arrived to defray the cost of caring for the retired racehorse, who has since been adopted and is "living happily", according to Strack, in Egg Harbor Township with his new owner. "We really appreciate people like Robb, who place off-the-track thoroughbreds in our care BEFORE they have to go through the auction pipeline," said Strack via email on Thursday. "Sword Trick is an amazing horse -- he went from one extreme (a racing sport horse) to an easy-going Western trail horse." "It just goes to show how awesome these horses are -- they can be retrained and given a whole new life," said Strack. I had heard numerous ads on Sirius radio about thoroughbred retirement programs, but my first hands-on experience came this spring, when my kids and I visited the non-profit, Old Friends, just outside Lexington, KY as part of our trip to Keeneland. Old Friends, much like SJHR, depends on the generosity of individuals who care enough about the well-being of phenomenal animals that give us great thrills as fans of thoroughbred racing. Outfits such as these often are not as lucky to get a horse in as good a condition as Sword Trick. "In the past, we have taken abused and neglected horses from kill broker pens and the SPCA," said Strack, "and they all have come back as happy, healthy pets." 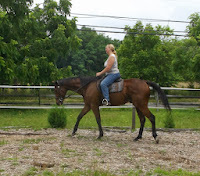 To be sure, the tour guide at Old Friends during my visit this spring relayed a story about a multi-graded stakes winner that the farm took in after, by luck, a kind soul bought the horse off a kill truck for $25. Those kinds of stories are gut-wrenching and, in my view, should make all horseplayers hold those in the thoroughbred racing industry to the highest standards of ownership. Donations are just the start, and I would encourage readers to consider South Jersey Horse Rescue or a rescue outfit of their choice as part of their annual charitable giving. Continuing the retirement theme, Kenwood's illustrious 9-year-old Hermosillo, meanwhile, is a race away from his retirement after 11 wins, 16 seconds and seven thirds over 74 lifetime starts. Hermosillo, a past New Jersey Horse of the Year, will break at 12-to-1 from Post 2 in the Charles Hesse III Stakes, Race 9, slated for 4:58 p.m. ET. A win in this $60,000 race would push Hermosillo's lifetime earnings above $700,000 and produce his third Hesse Stakes victory (2009 and 2011 were the others). "We are very proud of him no matter what he does here," said Levinsky by email on Thursday. "If we can find a way to win it, we'll be over the moon and back." Unfortunately, this is the kind of story (like SJHR's efforts) that get scant publicity. Rest assured, however, that Hermosillo, like every horse in the Kenwood stable, will find good, safe homes when their racing careers are done. Kenwood sends out two other runners at Monmouth on Saturday -- Alarming Affair (Race 3) and Carl's Only Vice (Race 4). Obviously, I wish the Kenwood runners and all other connections an extremely safe and productive afternoon in Oceanport. It appears the weather will cooperate. (Rutgers-Arkansas football wins out for me as a season-ticket holder, however, so I'll be watching the replay show). Saturday's race card is relatively deep, with three stakes races and only 2 (of 10) races with less than eight horses entered, presenting good betting opportunities for horseplayers. The one drawback, underpinning my criticism of New Jersey's thoroughbred program and opinion that the State's political leaders give short shrift to the industry, is the absence of 2-year-old races. A program touting the Garden State's livestock should at the least provide the racing world a glimpse of some promising 2-year-old horses to look forward to next season. Saturday's Monmouth card is for horses 3 and up, which could signal trouble for the state's breeding program. Rival tracks in New York, Kentucky, Pennsylvania and California, on the other hand, have all carded a handful of 2-year-old races tomorrow. One idea I have mentioned once or twice in passing here on NJHorseplayer.com has been to develop a competitive J-bred racing series during the spring that culminates into some kind of championship, or for 3-year-old horses, a play-in to spots in the Haskell Invitational. The thought may be insulting to some, but the state's showcase race (the Haskell) should infuse some element to promote the J-bred racing program while at least the rest of the U.S. racing world is watching, rather than (as it stands now) a chance for some rich barn to ship in a stud to wallop 5-6 other so-so horses and ship out the next day with a $600,000 winner's purse. 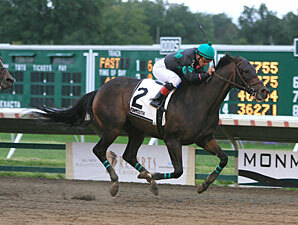 Perhaps it's a pipe-dream, but NJ Horseplayer loves the long-shots! I just watched the replay, Robb, and Hermosillo's one gutty horse -- hung in there until the end. Here's to hoping he exited the race sound and eager for retirement!